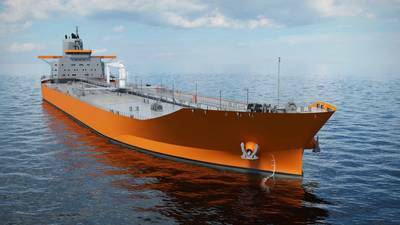 A new, highly efficient, Aframax tanker design offering practical and viable solutions that meet current and forthcoming emissions legislation was launched by Wärtsilä at the Posidonia 2014 exhibition in Athens, Greece. The new Aframax design emphasises energy efficiency to provide lower operating costs and enhanced environmental performance. It features an optimised hull form to minimize resistance, and an optimised propulsion train with energy saving devices (ESDs) for greater efficiency. Fuel savings have been the primary focus during the development of this design, and significant testing of the hull lines by both CFD and tank testing have successfully produced a highly competitive design. Wärtsilä explains that it offers the Aframax design in three, fit-for-purpose versions; the Basic configuration using conventional HFO fuel, Environmental with the exhaust emissions cleaned using a scrubber and selective catalyst reduction (SCR), and the Green version based on dual-fuel engines using LNG. The design can also be adapted for Ice Class notation. The desingners add that they also offer shipyards a solution based approach with integration packages and full support throughout the planning and execution phases. "Wärtsilä is an experienced and innovative global supplier of efficient, reliable and environmentally sustainable ship designs that fully meet the needs of the rapidly changing marine sector. Our focus is always on lowering operating costs and increasing fuel efficiency, and these elements are clearly evident in the new Aframax design." "In particular, our technology leadership in dual-fuel engines and LNG fuel systems gives us obvious advantages in developing ship designs for gas fuel propulsion. We are leading the way in taking merchant shipping into the gas fuel age," says Riku-Pekka Hägg, Vice President Wärtsilä Ship Design.